Everyone loves a big fat filthy bass guitar sound, and a lot of bass players use the Rat to get it. 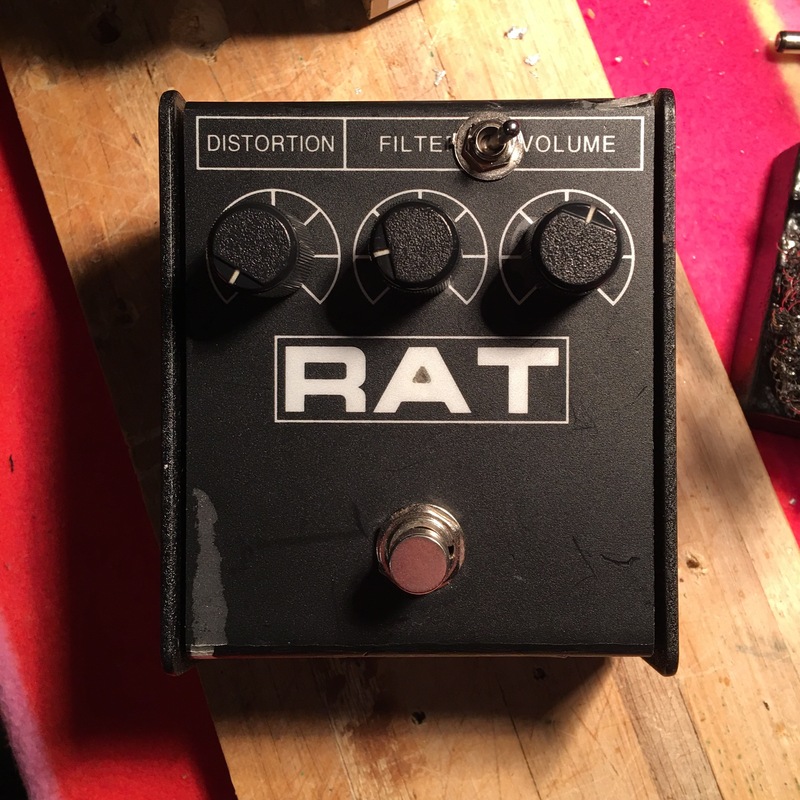 I love the Rat, it’s one of my favourite guitar pedals, but the trouble for bass players is, that it’s designed for guitar, so it doesn’t act on lower frequencies as much. I’m just going to use it as a filthy tone on top of the SansAmp. So I need it to keep as much bottom end whilst still boosting the volume and breaking up a bit harder. I hunted around online for a suitable mod, and found the perfect one: The Bass Bost Mod by GGBB. 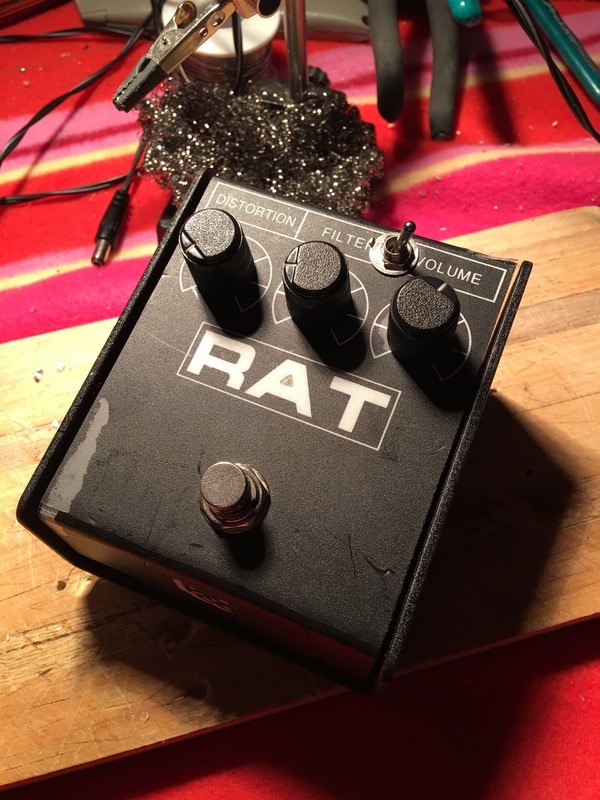 It works by boosting the bass without changing the sonic signature of the Rat. Replaced the power socket with a standard 2.1mm “Boss style” one. Added a 3 way switch to select: Stock, More Bass, or Even More Bass. This was a matter of removing one component and replacing it with another. Drilling a hole in the enclosure was the hardest part, literally – the Rat is thick steel. 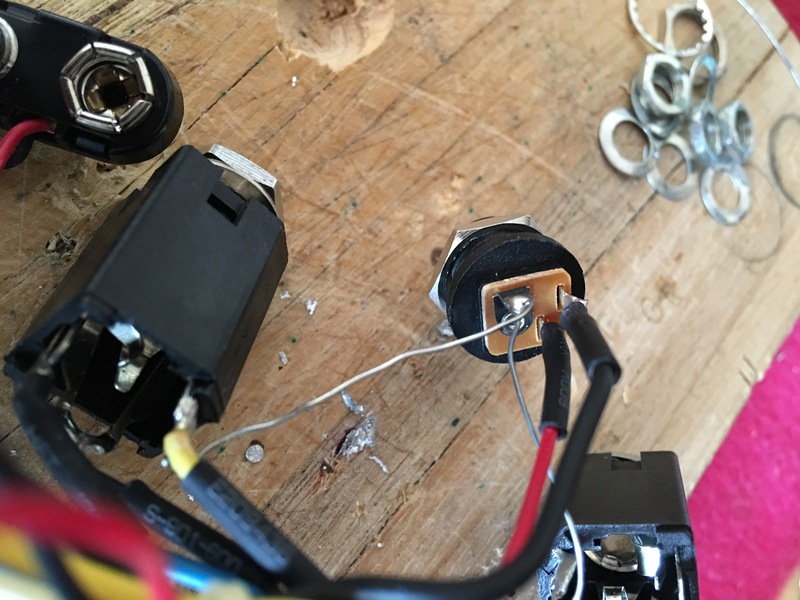 The mod involves adding a 3 way switch to select the amount of bass to let into the rest of the Rat circuit. 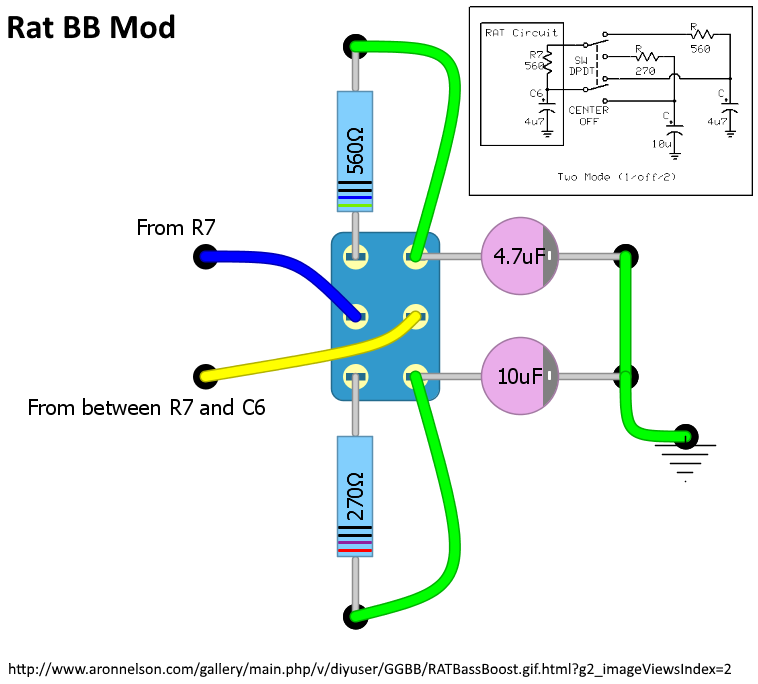 Here is my layout based on the schematic provided by GGBB. When the switch is in the centre position, it is a stock standard un-modified Rat. To one side it adds more bass, and to the other it adds even more bass. The switch was a very tight fit! 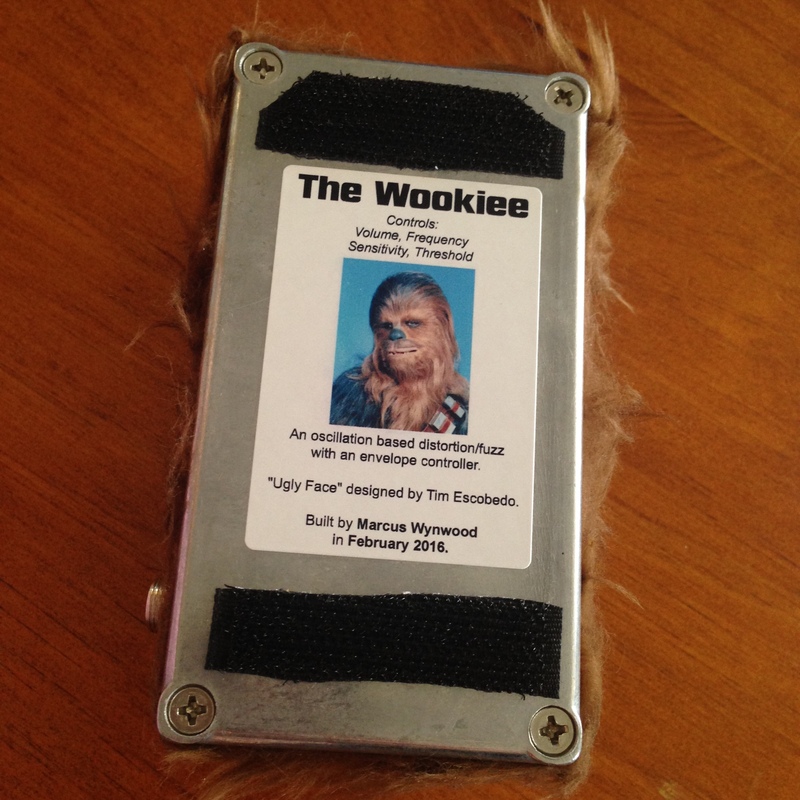 “The Wookiee” is my implementation of the Uglyface by Tim Escobedo. 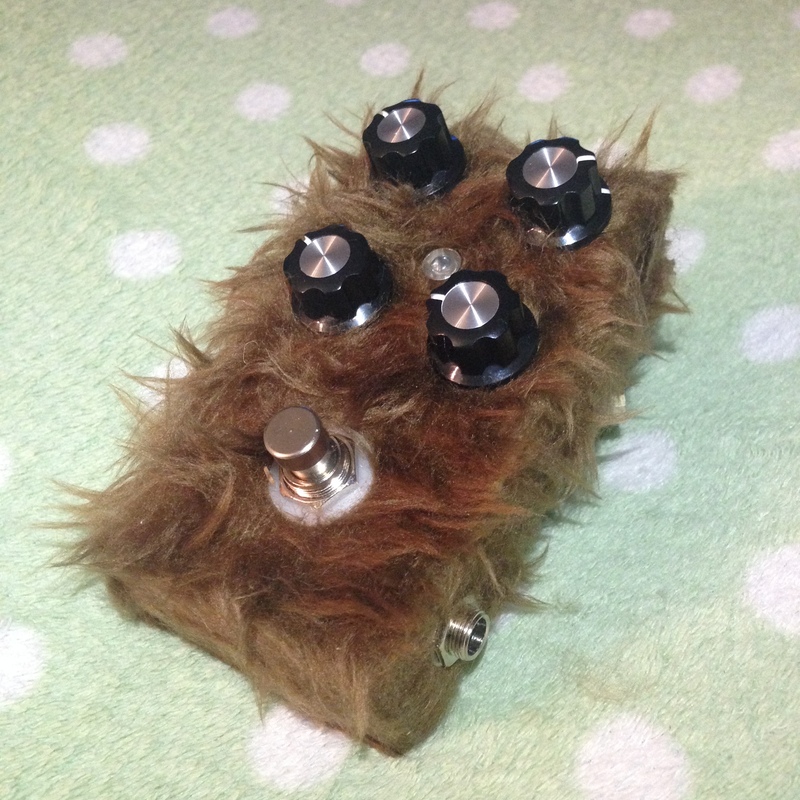 It is an oscillation based distortion/fuzz with an envelope control. Complete chaotic noisy madness, just the way I like it. 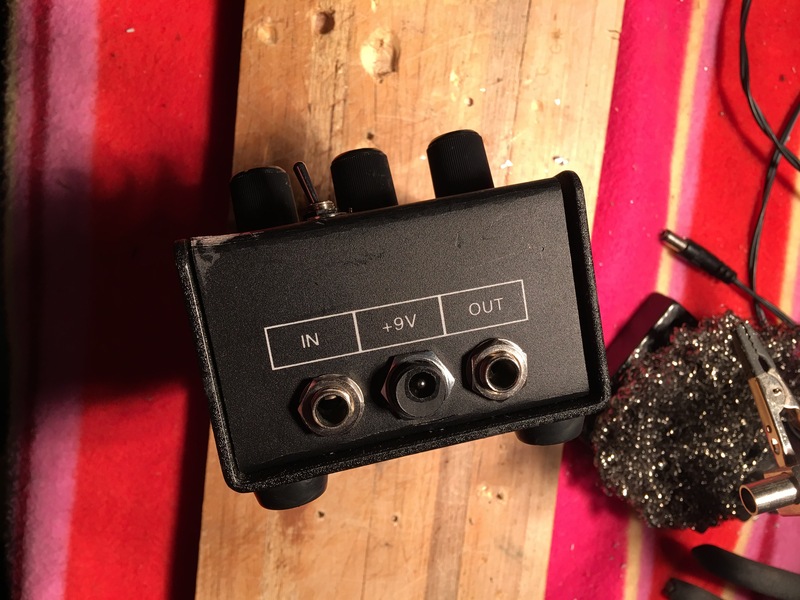 Most DIY effects are clones of commercially available effects, but the Uglyface is one of the few that is unique to the DIY community. You can’t just buy one, you have to make it. Kinda like a light sabre I guess. 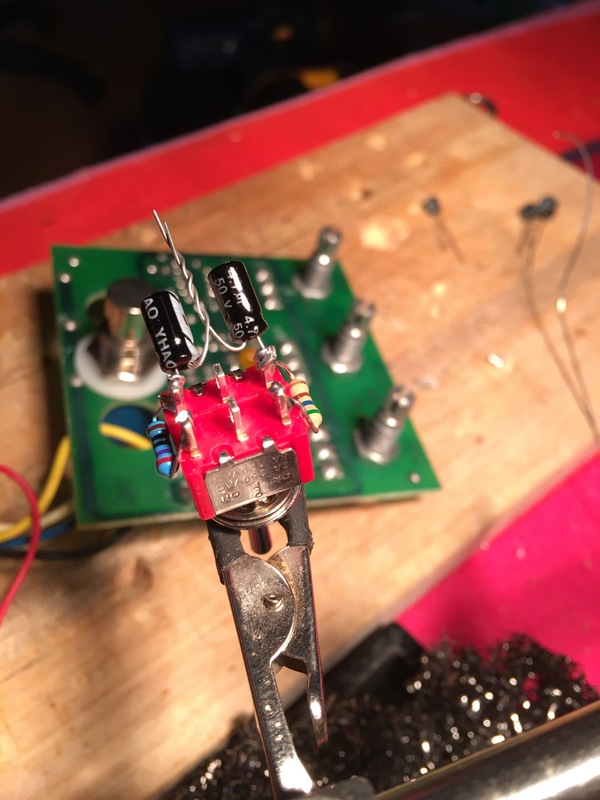 I built this on a PCB from MusicPCB, it was a great quality board that was really easy to work with. I might try more of their stuff. 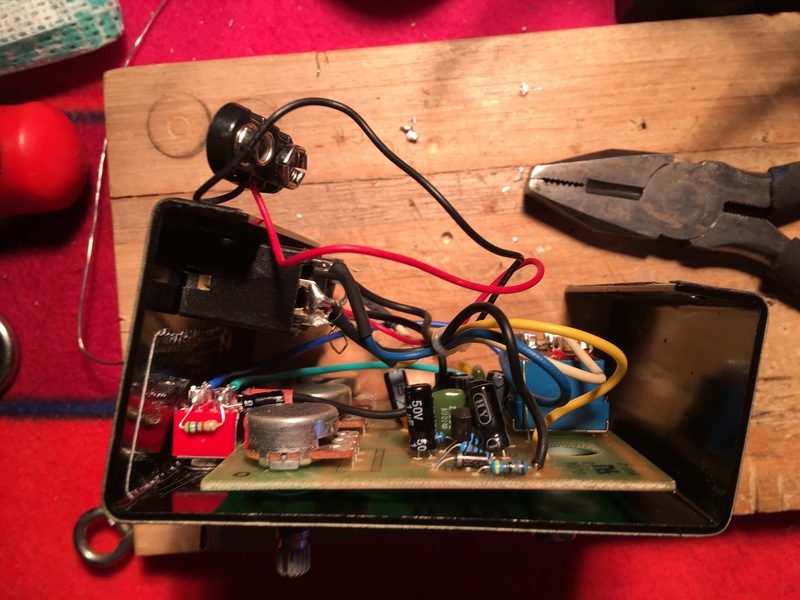 Once I got the circuit working, I started on the enclosure. The enclosure was an old one full of random holes from previous builds. 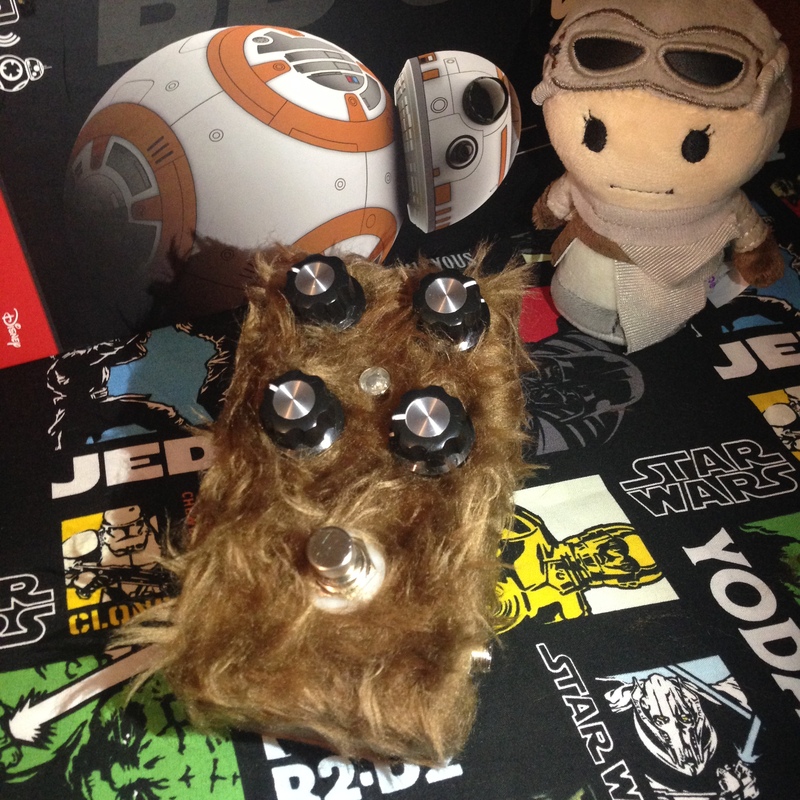 I had the idea of covering it in fur to make it look like Chewbacca, because it seemed to suit the noises this thing makes. After drilling the holes I needed, I bought some fake fur from Spotlight and stuck it on with SikaBond Spray Fix. It’s pretty much super glue in a spray can. Then it was just a matter of mounting everything inside. I’m really happy with how it turned out. There’s lots of awesome crazy noises in this box. I’m not getting the laser sounds that some builds seem to get, but I think the nature of the circuit is that it’s pretty random and unpredictable, so I might try some different ICs and cap values and see how that changes things. 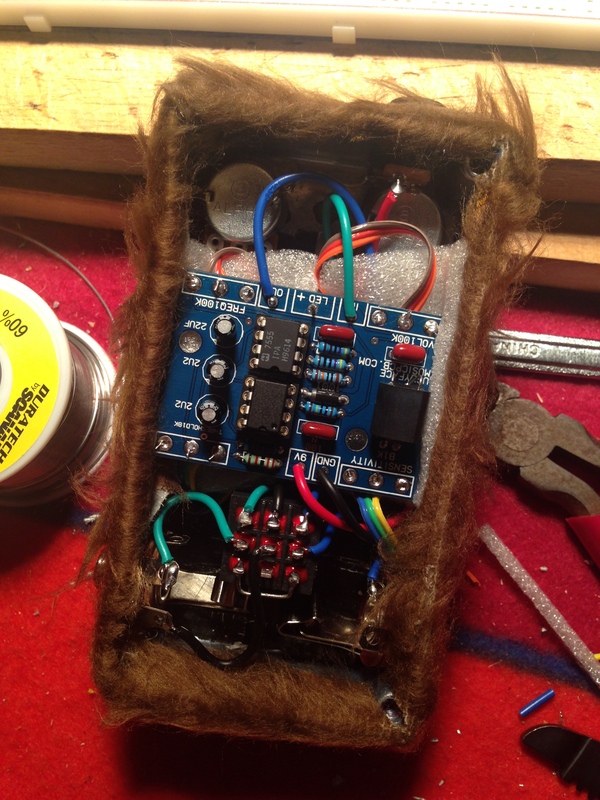 The Hairy Elephant is a fuzz based on a very similarly named pedal. Its controls are: Volume, Tone, Hair, and Pinch. I built it in search of that buzzed out, right in your face, can’t be ignored, fuzz sound à la QOTSA or Jack White on Lazaretto. It gets pretty close, and can almost sound like a torn speaker. There’s heaps of bottom end (works well on bass too apparently), and with the ‘Tone’ cranked there seems to be more top end than my Fuzz Factory too. The ‘Hair’ knob controls the amount of fuzz, and ‘Pinch’ lets you get that gated chop – and can go from very aggressive sounding single notes to that 8-bit gated sound. I’m pretty happy with how these turned out. They sound great, and I think my builds are getting neater. I built two of them simultaneously (based on this layout). 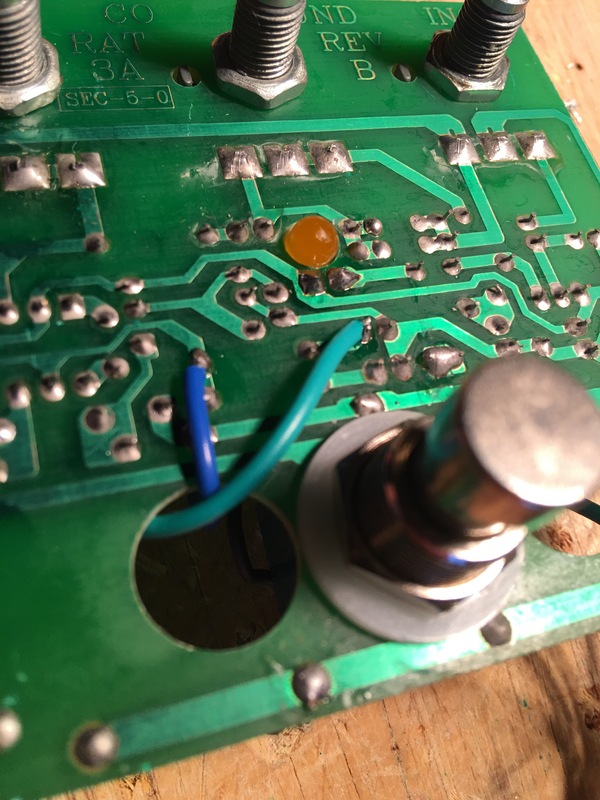 I prepared, populated and soldered both boards, drilled holes in both the enclosures, added all the off-board stuff (pots, jacks, foot-switch, LED, etc…), wired them both up, and finished them off with a nice sticker for the bottom. It wasn’t really much more work than just building one. Maybe what I’ll do in the future to try and fund this DIY addiction, is build two of everything and chuck the second one up on eBay. Both of these pedals are accounted for this time though: one for me, and one for the other guitarist in my band, Mitch.